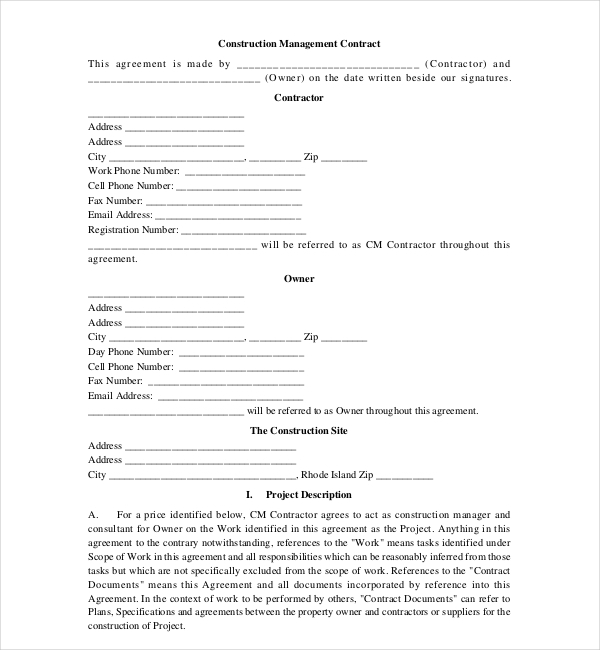 Construction contract form is a legal and mutually binding agreement between two parties. It is an agreement based on conditions and policies recorded in a document format. One of the two parties is the owner and the other one is a contractor. While the agreement is a legal one, the owner has the full authority to decide on the terms and regulations for the development to be constructed. They have the power to set legally bound rules in a contractual agreement. Construction Forms are of various types that you can get online. 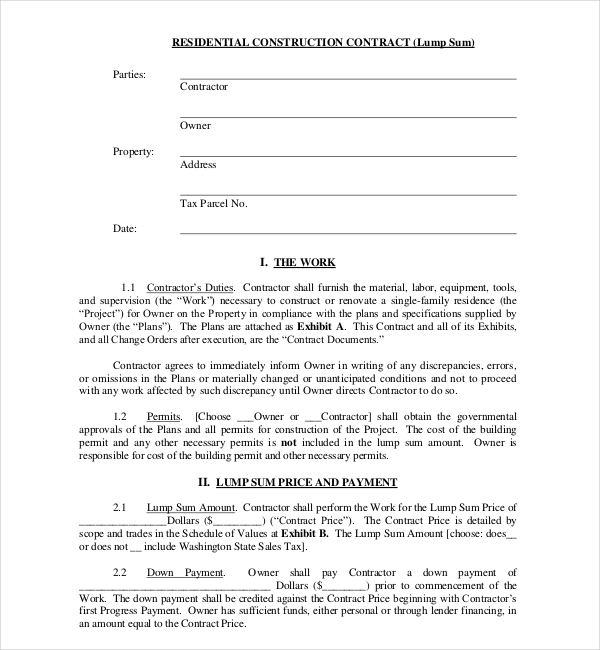 This form is a document where the party and owner come to a mutual agreement for a residential construction. The form has information and agreement about price and payment, work, changes, contractor’s warranty, schedule, insurance, indemnity, safety, mediation and termination rules, and general other terms before start of the work. The construction management contractor fixes the details about the construction site, contract price, project description, schedule discussion, fees and permits, payment plans, insurance, keeping the owner updated and general requirements. The details about the contractor and the owner must be given accurately. 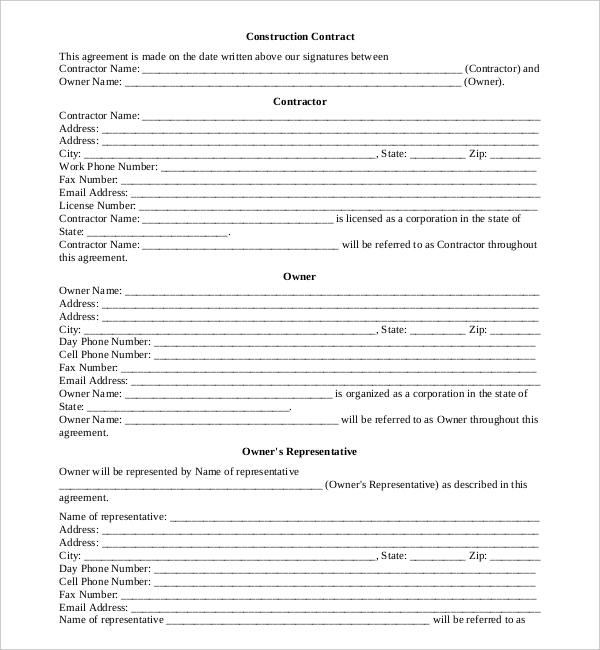 This form is for construction in Rhode Island. This form is for remodeling a construction site and discusses the terms of remodeling. A description for remodeling is stated. The change orders are signed by all parties. Permits, approvals and license, insurance, risks, site conditions, payment and the schedules are discussed. Warranties, disputes and scope of work are also discussed. The owner and the contractor have an agreement that discusses the construction relating to commercial sites. The terms and conditions of the contractor is written in the agreement along with the conditions of the owner. Miscellaneous provisions and are also written in this document. The contract is to be read carefully and then signed accordingly. 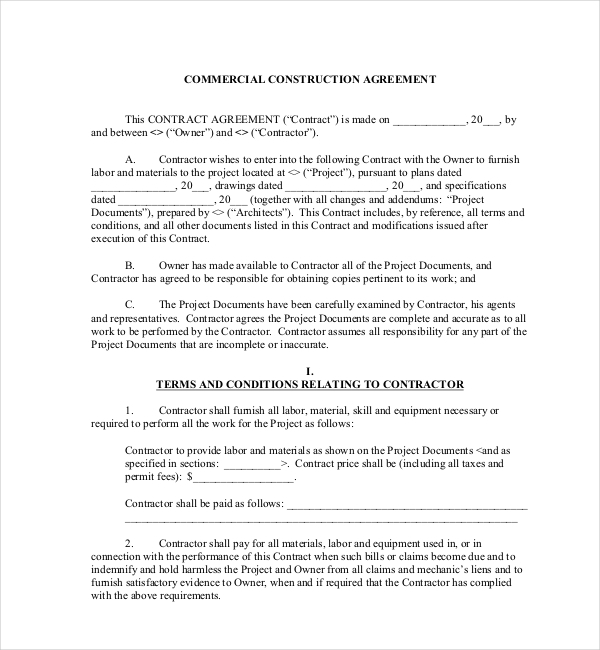 This sample forms are used by the contractor and the owner to come to a mutual agreement about the pay, construction site, schedule, change in work, survey reports, site inspection, termination terms, arbitrations, special provisions and many other aspects of construction related topics are discussed and written in the document. 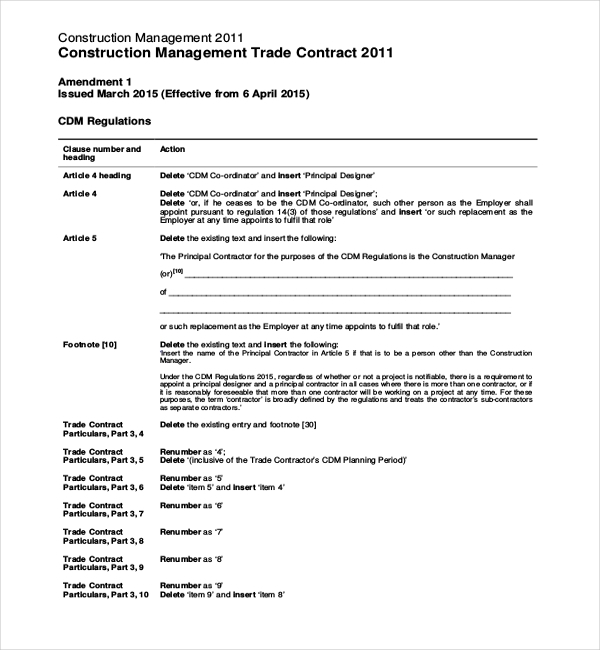 A sample construction form can be downloaded from the internet. This contract covers all the points that are required under the legal process. 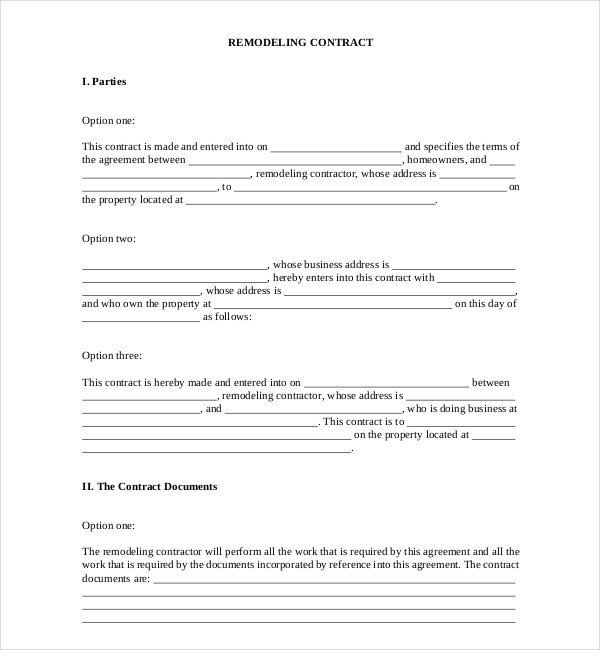 These contracts are signed by the owner and the contractor so that there is proof of agreement in written format. This can be used as evidence as well, in case any problem arises. 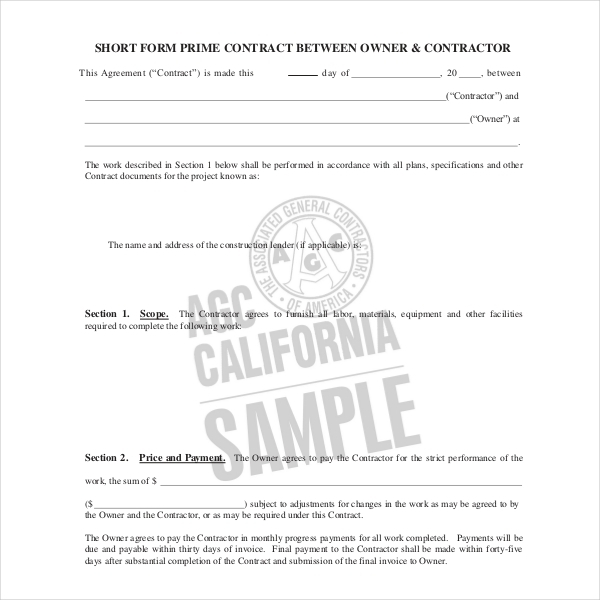 Construction contract forms have a written agreement about the site, property and owner’s conditions. These forms can be used for renovation or mortgage purposes. The price, work, change orders, procedures of payment, interests on payment, responsibilities of the contractor etc. are written in this document for future references as well. 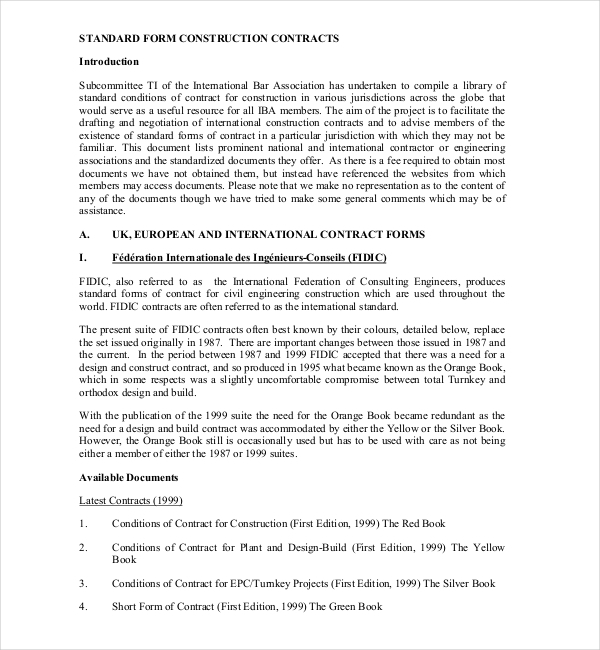 The standard forms construction contract is a small guide on the Australian construction industry that has all the research work done about a standard construction contract form. From findings to background and methodology, surveyed questions and even specific feedbacks on construction forms of Australia is given in this. It is based on the Construction Law Australia. 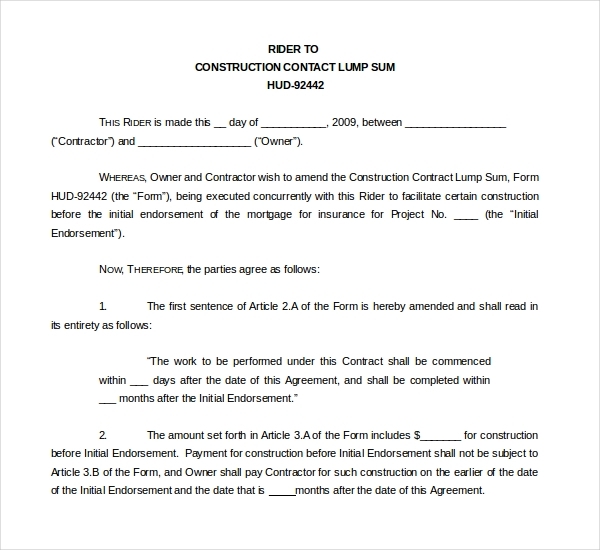 A lump sum construction contract is a type of form that has an owner who agrees to pay contractor a specific amount after the finishing of the work without any cost breakdown. After the work, no detailed measurement is required. This form is by the US HUD, i.e., the Housing and Development department. This contract is based on the CDM regulations. There are a number of amendments done in this trade contract with a number of insertion and deletions under the specific clause and headings. This is for reference; incorporation and modification in future trade contracts. A construction contract is specifically negotiated for building up an asset which is closely related to or interdependent in terms of function, the design and technology or their ultimate use or purpose. The form is a legal agreement between an owner and a contractor based on which the construction or remodeling works start from hereon. The forms are significant for legal purposes as this document is a physical evidence of anything both the parties has agreed on. Contract helps in settling the entire situation previously to avoid problems in the future. The document is also made to let the construction form, owner and contractor know that they are following a proper legal procedure to start a project. This is an important step towards a project plan. This proposal is created to avoid any kind of problems related to payment, site, schedules, change orders etc. It gives a clear guideline to both the parties to avoid certain risks. These forms may be used for commercial purposes, residential, agricultural, educational purposes as well. These contracts can be used for loan sanction as well. These forms are quite important and must be read by the owner and the contractor carefully before signing it. Creating a form like this takes a lot of time. Every aspect of the project needs to be touched upon carefully in order to avoid hassles. The original documents related to the property, owner and contractor must be present for verification. Any false information in this document may lead to a criminal offence. These agreement forms are available in modest fees if one wants to create a document from scratch. If there is no agreement signed between both the parties, it may lead to major risks like- the contractor not getting paid, the owner not getting their work done in time, there may be higher risks of small disputes without the forms. Situations like delay, overrun costs, substandard works can be avoided if the parties sign this agreement. This contract can be showed in the court of law if any unpredictable problems occur. Negotiated contract turned key contract, package contract, continuing contract and running contract are 5 special contracts. Heavy civil- Water-related infrastructure, rail roads, dams, roads, bridges come under this category of construction types. Commercial- Banks, warehouse, malls, shops, theatre, casinos, resorts and other entertainment buildings are built under this category. Residential- The houses, bungalows, mansions, complexes for the citizens of the country come under this category. Industrial- Pipelines, sea port, steel mills, power plants, chemical platforms and oil factories come under this category. Farming- Animal sheds, storage area, equipment garage, barns, reservoirs, drains come under this category. Educational – Dorms, Research labs, libraries, government buildings, hospitals/clinics come under this category. For those who struggle to find such forms, they should not worry any more. These sample forms are easily available online which can be downloadable and printed. You can edit is according to your requirements as well. Our website provides a well-tailored form which as greater compatibility for both higher and lower versions. These forms are error free and have a high success rate. You can get these forms in Word of PDF formats. As much as possible, these forms do not require further customization, but still if you need any edits, we shall be happy to do so. You are just one click away to get the form that you need. 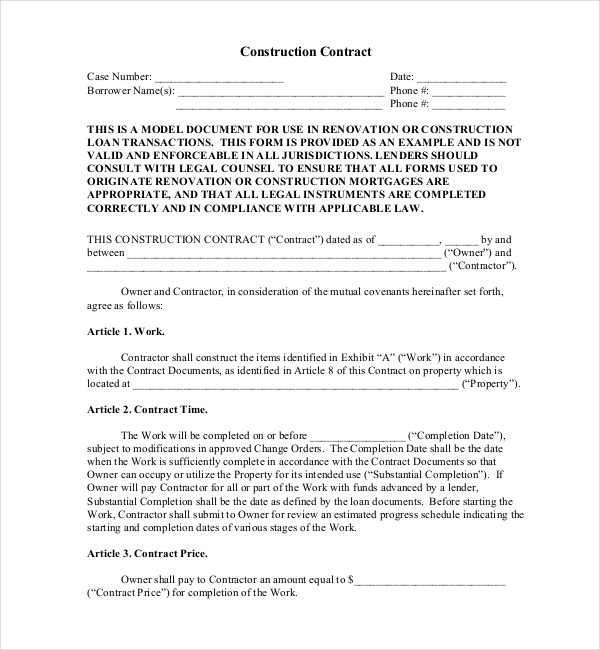 Construction Contract forms are needed in every field of construction be it for residential or commercial purposes. To have a form ready for any purposes is always a good decision than to not have at all. The process of creating these forms is quite lengthy because majority of the projects are quite big.